In 3D game animation, you can create special effects with particles. A particle system is a collection of small shaded objects that act together as a group with a degree of randomness. These systems may be used to create smoke, fire, paint spray, snowfall, dust storms, and more. Particle systems are great for adding all sorts of special effects, but keeping track of all those small pieces can really take lots of computing power. This means that using them within a game engine is difficult, but they work well for cut scenes when you aren’t limited by the number of polygons the scene can handle. Particles can come in many different shapes. They can be small cubes, simple points, spheres, or flat planes that always face the camera. The size and randomness of the particle’s size are configurable. Particles can also have materials and random materials to add variety to the system. Particle materials can also be animated to change over time. All particles have a life span that determines how long the particles stay around in the scene. The key to creating a good smoke and dust particle effect is to create enough particles that each individual element can no longer be identified. Smoke and dust can affect the lighting in the scene. Be sure to disable highlights for any material that is applied to smoke and dust particles. Fire can be created by simply endowing particles with a glowing material that radiates into the world. Making the particle material semi-transparent gives the flames the consistent look. Another way to use particles is to create clouds. Hundreds of semi-transparent particles clumped together can create wonderfully realistic clouds. 1. Select the Create –> Polygon Primitives –> Sphere menu command to create a sphere object. Then scale the sphere object to fill the entire view. This sphere object provides an object to which you can apply a fire effect. 2. With the sphere selected, choose the Effects –> Create Fire menu command. 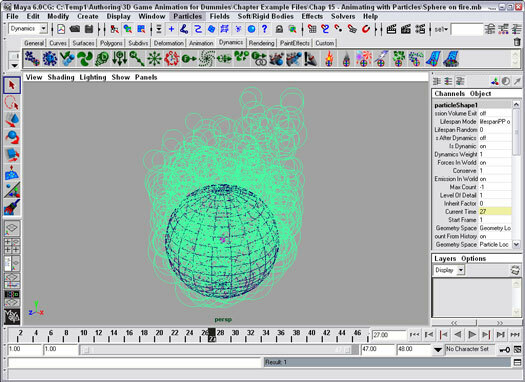 A fire emitter object is added to the center of the sphere object. The Effects menu can be found within the Dynamics menu set. 3. Drag the current frame marker in the Timeline to see the flames rise from the sphere object. The rising particles are random in nature and displayed as circles in the Perspective view, as shown in Figure 1. Each particle has a glowing transparent material applied to it. Each of these settings can be configured, but the fire effect is common enough that it is made available as a preset. Other effect presets include Smoke, Fireworks, and Lightning. Figure 1: Fire particles are displayed as circles in the Perspective view. 4. Select the Render –> Render Current Frame menu command to render the scene. Particle effects such as fire can be seen only when rendered. This command renders the scene in a separate window. Figure 2 shows a rendered fire effect. The Render menu can be found within the Rendering menu set. 5. Select the File –> Save Scene As menu command, and save the file as Sphere on fire.mb. Close the file when you are finished. This file includes a simple sphere with a fire particle effect applied to it. 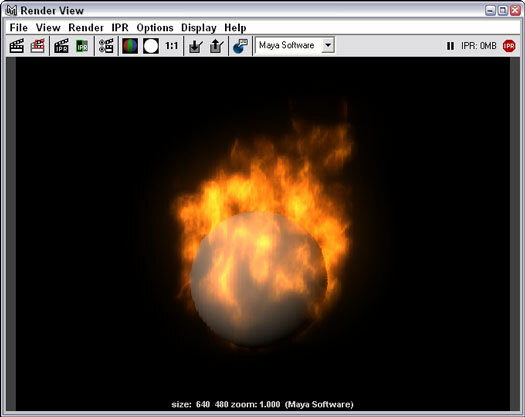 Figure 2: With rendered fire effects, the sphere appears to be on fire.